EC3 connector set - pkg of 2 mating housings and 4 gold-plated contacts. 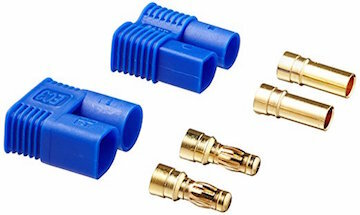 EC3 connector set: 2 mating housings & 4 Gold-plated connector pins. Note: The Blue connector that goes on a Battery pack is the one with the narrower blue tips (more space between them). The Blue housing with fatter tips goes on the Charger - Motor. 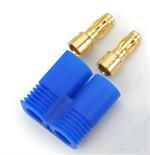 Also, the blue tips with the Squared End are typically POSITIVE (+ Red wire). The Semi-Circle end is typically NEGATIVE (-) .Original part ref. # EFLACE303.BULK PRICING AVAILABLE - see quantity options. Hint: if you want, say, 2 or 3 sets, choose "just one set" when ordering, and then change quantity to 2, or 3, or whatever you need. 3S3000EC3: 11.1 volt 3000mAh rechargeable Li-PO battery for electric flight. UPGRADE BATTERY; it replaces the 11.1v 2200mAh models. Fits Quads, Helis, Airplanes, Cars, boats, trucks. Size: 108.00*28.00*35.00mm (4.25*1.10*1.37inch). Weight = 7 ounces.